First of all, let me apologize for not posting a blog yesterday. You see, Trey is out of town, and I woke up with a down-right painful crick in my neck, and I had about 5 movies that I recently picked up from the library in anticipation of Trey’s absence, AND when my “post blog entry” alarm went off yesterday morning I was in the bathroom. So, when I finally remembered that my alarm had gone off several hours later, I just wasn’t in the mood. Call me crazy, call me lazy, call me what you will – but sometimes, even though I love writing, I just don’t feel like it. Some days the pressure of saying anything remotely interesting at all is just too much. Other days I fancy myself as something brilliant and can’t wait to pour out whatever words are floating around my gargantuan noggin’. But yesterday wasn’t one of those days. Yesterday was a lazy day. Yesterday was a paint my toenails and eat couscous and watch old musicals kind of day. Speaking of old musicals, you know what gem I uncovered at the Patrick Heath Public Library? 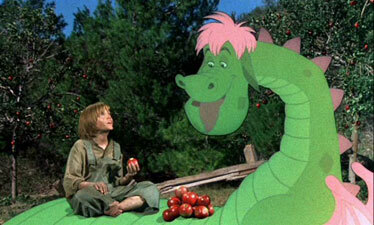 Pete’s Dragon. PETE’S DRAGON! Seriously, Disney, why don’t you make movies like that anymore? Why must we tolerate things like Hannah Montana instead of the soothing image of Helen Reddy telling me she’ll be my “Candle on the Water”??? Ya know, for a film that debuted in 1977, they did a fantastic job editing in that cartoon dragon…better than some modern editing. It honest to goodness looks like Pete (played by Sean Marshall, who is stinkin’ precious, by the way) is climbing up on Elliot’s tummy (Elliot’s the dragon…duh) to eat those apples! Anyway, I realize that this isn’t the intellectual prose you were most likely looking for (ha! ), but it’s what’s on my mind. I just miss the movies I grew up on: Pete’s Dragon, Pollyanna, Annie, Mighty Ducks, 3 Ninjas – they just don’t make ’em like that any more! So, I’m having surgery in a week and a half that will result in my being flat on my back recovering for a couple of weeks. I’ve been stockpiling political biographies to read during my convalescence, but this post was clearly sent to me from on high to make me realize that what I REALLY need to be preparing for is to spend those two weeks reacquainting myself with Hayley Mills and possibly the Swiss Family Robinson. Thanks, darling! Seriously, nothing lifts the spirit like an old Disney movie. Best of luck with the surgery dear! Prayers for a speedy recovery (but not so speedy that you don’t get to thoroughly enjoy the R&R that comes with it).